Lee Archer, M.D., chairman of the Department of Neurology, has been honored with the President’s Award for a Lifetime of Outstanding Contributions to Medicine from the Pulaski County Medical Society. Jan. 29, 2019 | Robert L. “Lee” Archer, M.D., chairman of the College of Medicine Department of Neurology at the University of Arkansas for Medical Sciences (UAMS), has been honored with a lifetime achievement award from the Pulaski County Medical Society. Society President Amir Qureshi, M.D., presented Archer with the President’s Award for a Lifetime of Outstanding Contributions to Medicine during the society’s annual meeting Dec. 6 at the William J. Clinton Presidential Library in Little Rock. A fixture at UAMS for more than 30 years, Archer provides world-class care for Arkansans with multiple sclerosis (MS), while teaching and mentoring future neurologists. He has earned the admiration of his patients, students, residents and colleagues. Archer was nominated by his peers and confirmed in a vote by the society’s board of directors. Archer is a neurologist and professor in the UAMS College of Medicine. He also holds the Major and Ruth Nodini Chair in Neurology, a $1.5 million endowment that supports his clinical care, multiple sclerosis research and educational programs. Archer is president of the Arkansas Medical Society, the largest professional society for physicians in the state. An El Dorado native, Archer attended the University of Arkansas at Fayetteville and earned his medical degree at UAMS in 1982. 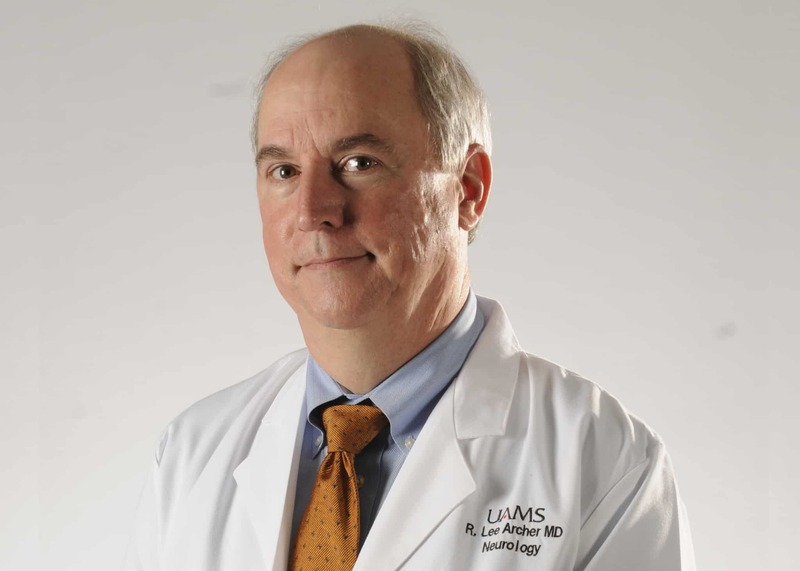 He completed his residency at UAMS, joined the faculty in 1986 and has held the rank of professor since 2008. He founded UAMS’ Multiple Sclerosis Service in 1987 and co-directed the Muscular Dystrophy Association Clinic at UAMS from 1989 to 2003. Archer served 13 years as chair of the University Hospital Medical Ethics Advisory Committee. He has served on many other institutional panels, including the College of Medicine Promotion and Tenure Committee, which he chaired in 2016-2017. He became interim chair of the Department of Neurology in July 2016 and became chairman in August 2017. Archer is also active in the National Multiple Sclerosis Society and several civic organizations. He has served on the Board of Directors for the Arkansas Regional Organ Recovery Association (ARORA) since 2005 and chaired the organization in 2014-2016. Graduating College of Medicine seniors have awarded Archer three Gold Sash and numerous Red Sash awards for his teaching. He received the Distinguished Faculty Award from the College of Medicine Alumni Association in 2007. In 1999 he received the inaugural Humanism in Medicine Award for faculty in the college. He received the UAMS Helen May Compassionate Care Award in 2015 and was honored later that year as the Physician of the Year in the Arkansas Business Health Care Heroes ceremony. Among many “Best Doctors” recognitions he was voted in 2010 as the Best Neurologist in Arkansas and featured on the cover of the Arkansas Times. The Pulaski County Medical Society was the first medical organization chartered by the state of Arkansas in 1866. For more than 150 years, its physicians have been the voices for organized medicine at the community level. The society aims to promote the highest standards of medical care, protect the public health of the community and guard the professional interests of its members.